Atrial fibrillation (AF) is the most common type of cardiac arrhythmia. The poor performance of current AF treatment is due to a lack of understanding of the structure of the human atria. Nowadays, gadolinium contrast agencies are used in a third of all MRI scans to improve the clarity of the images of a patient's internal structures, such as the atria. Gadolinium-enhanced magnetic resonance imaging (GE-MRI) is widely used to study the extent of fibrosis (scars) across the atria . Recent studies on human atria imaged with GE-MRI have suggested fingerprints of the atrial structure may hold the key to understanding and reversing AF . Direct segmentation of the atrial chambers from GE-MRIs is very challenging due to the low contrast between the atrial tissue and background. 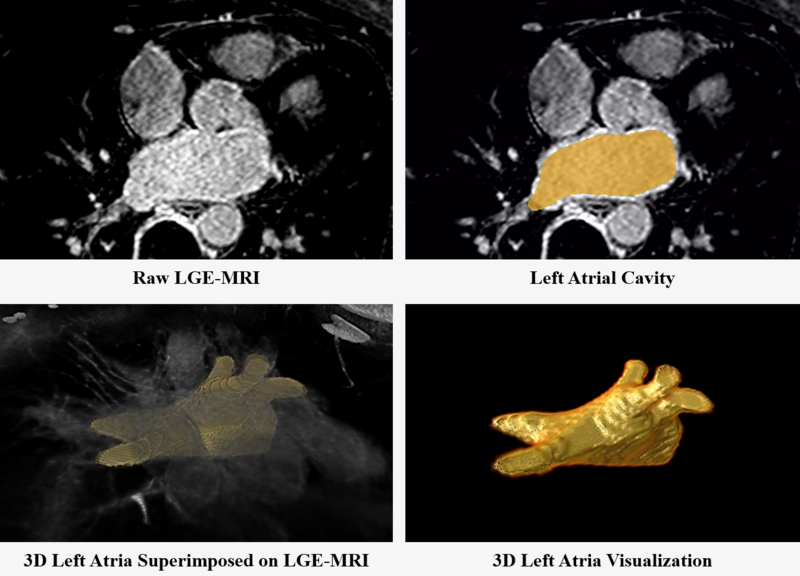 Most of the existing atrial structural analysis studies utilizing GE-MRIs have been based on labor-intensive, error/bias-prone manual segmentation. Hence, there is a need for an intelligent algorithm that can perform fully automatic atrial segmentation for the left atrial (LA) cavity, to accurately reconstruct and visualize the atrial structure for clinical usage . This challenge has provided an open competition for wider communities to test and validate their methods for image segmentation on a large 3D clinical dataset. The exciting development is a very important step towards patient-specific diagnostics and treatment of AF. The participants are required to produce a computational framework capable of performing fully automatic segmentation of the LA cavity from 3D GE-MRIs without any manual assistance. The participants will receive 100 data+masks to develop their approach and be evaluated on 54 different test data for evaluation. The participants will submit the masks of the LA cavity for the 54 patients. The evaluation will be done by comparing the submitted masks for the test data the with their manually segmented masks (not open to the public). The test data (data only) will be released 2 weeks prior to the deadline of the challenge so participants can submit their predicted masks. This challenge provides a chance for participants to carefully study and experiment on a large GE-MRI dataset, and further push the state-of-the-art performance for atria segmentation. To download the dataset and other relevant files, please visit the Data section of the challenge. To submit your predictions for the challenge, please visit the Submission section of the challenge. The competition organizers reserve the right to update the contest timeline if they deem it necessary. The team in 2nd place will receive $300 USD. The team in 3rd place will receive $200 USD. The top performers will also be invited to co-author in an international benchmarking study. Congratulations to the winners and thank you sponsors! Christopher McGann, Nazem Akoum, Amit Patel, Eugene Kholmovski, Patricia Revelo, Kavitha Damal, Brent Wilson, Josh Cates, Alexis Harrison, Ravi Ranjan, Nathan S. Burgon, Tom Greene, Dan Kim, Edward V.R. DiBella, Dennis Parker, Rob S. MacLeod, Nassir F. Marrouche. "Atrial fibrillation ablation outcome is predicted by left atrial remodeling on MRI." Circulation: Arrhythmia and Electrophysiology (2013): CIRCEP-113. Brian J. Hansen, Jichao Zhao, Thomas A. Csepe, Brandon T. Moore, Ning Li, Laura A. Jayne, Anuradha Kalyanasundaram, Praise Lim, Anna Bratasz, Kimerly A. Powell, Orlando P. Simonetti, Robert S.D. Higgins, Ahmet Kilic, Peter J. Mohler, Paul M.L. Janssen, Raul Weiss, John D. Hummel, Vadim V. Fedorov. "Atrial fibrillation driven by micro-anatomic intramural re-entry revealed by simultaneous sub-epicardial and sub-endocardial optical mapping in explanted human hearts." European heart journal 36, no. 35 (2015): 2390-2401. 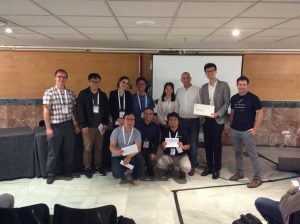 Jichao Zhao, Brian J. Hansen, Yufeng Wang, Thomas A. Csepe, Lidiya V. Sul, Alan Tang, Yiming Yuan, Ning Li, Anna Bratasz, Kimerly A. Powell, Ahmet Kilic, Peter J. Mohler, Paul M. L. Janssen, Raul Weiss, Orlando P. Simonetti, John D. Hummel, Vadim V. Fedorov. "Three‐dimensional Integrated Functional, Structural, and Computational Mapping to Define the Structural “Fingerprints” of Heart‐Specific Atrial Fibrillation Drivers in Human Heart Ex Vivo." Journal of the American Heart Association 6, no. 8 (2017): p.e005922. Zhaohan. Xiong, Vadim. V. Fedorov, Xiaohang. Fu, Elizabeth. Cheng, Rob. Macleod and Jichao. Zhao, "Fully Automatic Left Atrium Segmentation from Late Gadolinium Enhanced Magnetic Resonance Imaging Using a Dual Fully Convolutional Neural Network." IEEE Transactions on Medical Imaging (2018). For any personal questions, please contact the organizers at this email address: atriaseg2018@gmail.com.